A place that is within reach of two of the world’s greatest UNESCO World Heritage sites might seem like it’s too good to be true. That is until you take a getaway to the Far North city of Cairns—more specifically the quiet neighbourhood of Cairns North. And those two incredible natural wonders? They’re the Great Barrier Reef and the Daintree Rainforest. If you only came here to see those two sites that’d be enough, but there’s so much more. That’s why we’ve created this Cairns North travel guide for you. How do I get to Cairns North from the airport? 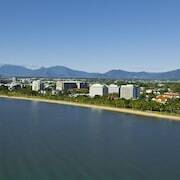 When you fly into this city, you’ll land at Cairns Airport (CNS), 3km from the central business district. In order to get to your Cairns North accommodation, book one of our rental cars, take a bus or hop in a taxi. You’ll be there in no time. What are the most popular hotels in Cairns North? What kind of hotels are in Cairns North? 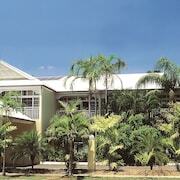 The variety of Cairns North hotels is about as diverse as the animals in the Daintree Rainforest. Well, maybe not that diverse, but you get the picture. 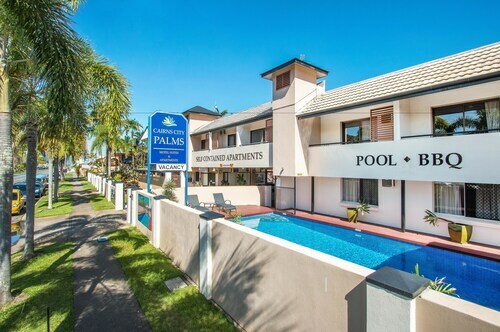 Reef Palms Motel: This apartment motel is perfect for your next holiday trip to the Far North. Why? Because you’ll be close to heaps of shopping, dining and nightlife options that are located along the Cairns Esplanade. Nomads Cairns Backpackers Hostel: With a full-service kitchen, on-site restaurant and a relaxing pool area, this place will feel more like a hotel rather than a hostel. And the best part of all, you’ll make friends from all over the world. 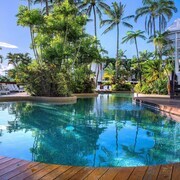 Where should I stay in Cairns North? We’re sure that question has been running through your head for days, possibly even weeks. But worry not, young padawan, because we have some suggestions regarding proper accommodation in Cairns North. 4-star amenities and facilities await you when book a stay at the City Plaza Apartments. There’s a tropically themed pool area with a barbecue pit that’s perfect for hosting afternoon fiestas. When you’re ready to go on an adventure outside your home away from home, stop by the on-site information desk and ask about all the fun tours being offered. Imagine waking up as the sun rises, revealing a vast blue ocean just outside your window. Actually, stop imagining—just reserve a room at the North Cove Waterfront Suites. There’s places to sleep ranging from one bedroom to four in case you’re travelling in a group like a pack of dingoes. What are some fun things to do in Cairns North? Have you ever wanted to explore the world’s largest coral reef system? Of course you do; that’s why people go on Cairns North holidays. And to see wild animals and eat amazing food. The Great Barrier Reef: We’re willing to bet that you’ve probably never seen anything quite like the reef system that lies just offshore. Make a reservation on one of the many dive tour companies and see this natural wonder from below the water’s surface. You’ll see creatures like sea turtles, reef sharks, clown fish and just about any other swimming critter you can think of. Cairns Wildlife Dome: Keep the nature and wildlife thing going with a visit to this glass-enclosed wildlife centre. Go for a crazy zip-line ride over a water pit filled with crocodiles. If you want an overload of cuteness, sign up for a koala encounter and get your picture taken holding one of the cute marsupials. Can you say Instagram likes? Food Trail Tours: Might as well load up on delicious cuisine while getting a tour of the city. You’ll stop by a tropical fruit winery, a cheese and chocolate factory, and a coffee and macadamia plantation. Mmmm, good. 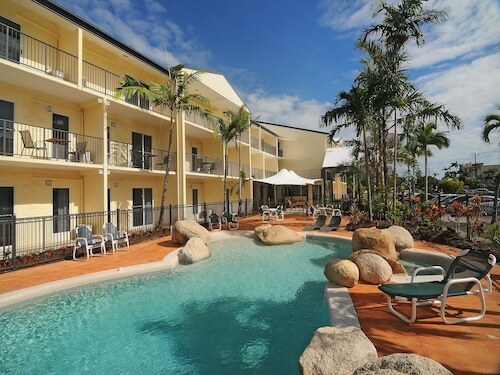 No matter how long your stay is, Wotif can provide you with a great Cairns North hotel. But if you feel like heading due south after your holiday in Queensland, book Hobart accommodation through Wotif and take a flight to the capital of Tasmania. Two cities in one trip—why not? How Much is a Hotel Room in Cairns North? 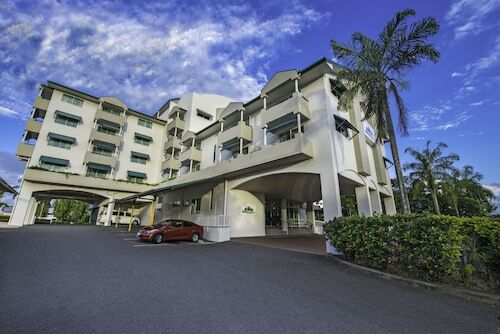 Hotels in Cairns North start at AU$67 per night. Prices and availability subject to change. Additional terms may apply. Easy access to the hotel, the room was spacious and comfortable.